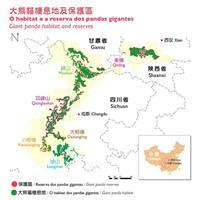 ​Currently, Pandas are only found in mountain systems like Min Shan, Qinling Qi, Liang Shan, Daxiang Ling, Xiaoxiang Ling and QiongLai Shan. These mountain systems are located in three Chinese provinces - Sichuan, Shanxi and Gansu respectively. Giant pandas perch mainly at an altitude of 1600 metres to 3600 metres, where mountainous bamboo forests are found within the evergreen mixed coniferous broad leaved forest.